Your Adult Siblings May Be The Secret To A Long, Happy Life : Shots - Health News Sibling relationships are the longest-lasting family ties we have, and they're among the most likely to bring health and happiness as we age. 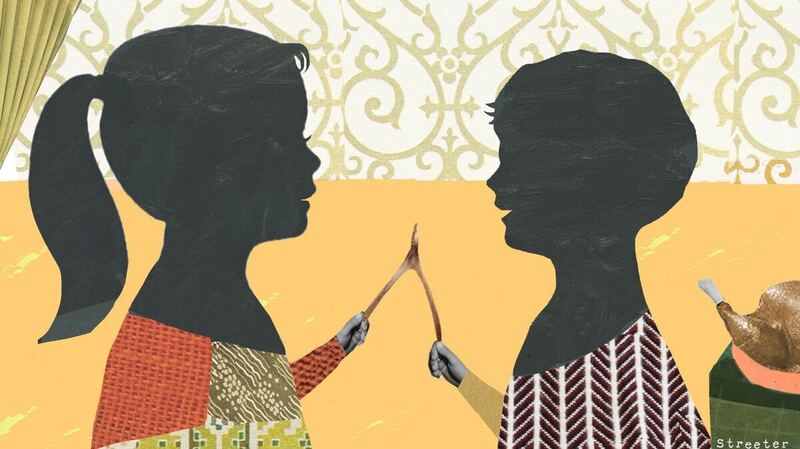 Think on that when your brother grabs the wishbone. Somehow we're squeezing 16 people into our apartment for Thanksgiving this year, with relatives ranging in age from my 30-year-old nephew to my 90-year-old mother. I love them all, but in a way the one I know best is the middle-aged man across the table whose blue eyes look just like mine: my younger brother Paul. Paul and I kind of irritated each other when we were kids; I would take bites out of his precisely made sandwiches in just the spot I knew he didn't want me to, and he would hang around the living room telling jokes when he knew I wanted to be alone with the boy on the couch. Most sibling relationships are close — two-thirds of people in one large study said a brother or sister was one of their best friends. But as adults, we've always had each other's backs, especially when it comes to dealing with our mother's health crises, which have become more frequent in the past few years. Paul is the first person I want to talk to when there's something that worries me about Mom; I know he'll be worried, too. There's probably a biological explanation for the intensity of the sibling bond. Siblings share half their genes, which evolutionary biologists say should be motivation enough for mutual devotion. ("I would lay down my life," British biologist J.B.S. Haldane once said, applying the arithmetic of kin selection, "for two brothers or eight cousins.") Siblings are a crucial part of a child's development, too, teaching one another socialization skills and the rules of dominance and hierarchy, all part of the eternal struggle for parental resources. One thing that can scuttle closeness in adulthood is a parent who played favorites in childhood; this sense of resentment can last a lifetime. During middle age and old age, indicators of well-being – mood, health, morale, stress, depression, loneliness, life satisfaction – are tied to how you feel about your brothers and sisters. Because of the particular intensity of sibling relationships, conflict cuts to the bone. People grieve for the frayed ties to their siblings as though they've lost a piece of themselves. "On this auspicious occasion, this special family dinner/If I argue with a loved one, Lord, please make me the winner."